We hope you had an awesome Christmas in Christ and felt the Father's love in the holiday. We're gonna keep the party going this week with a line up of some of our favorite songs from 2011. Actually, there were so many we wanted to play that we may make a supplemental mix to fit everyone in that will be available exclusively here on our website. Keep your eyes open for that as we work on it over the next couple of days. A couple of moments that needed special attention are the platforms that Mali Music and Lecrae were given to minister on this last year. Mali Music being on the BET Music Awards and 106 and Park was huge. Lecrae being on the BET Hip Hop Awards in the cypher was also monumental. Christian hip hop is growing and becoming a little more acceptable, but we can't forget that God is the reason for doing the music. Mali and Lecrae did an excellent job of not compromising their message as their lights shined in the midst of the world. Call or text any requests for next week's show to 775-375-KMRS. Like our Facebook Page at The Kingdom Minded Show. Download this week's episode for free here! Today we celebrate the birth of our Savior, the LORD Jesus Christ! Hallelujah! Along with Christmas music, we have new music by Andale and Joint Heirs and Exodus Movement. There's a whole lot of artists that called in to give you a special Christmas greeting too. We also took an opportunity to ask everyone within our voice to pray for Evangel and Redd Lettaz, who have experienced loss in their family last week. Don't forget to pray for the artists/ministers you listen to on a daily basis. They're men and women of God that need prayer just like us. Feel free to download this weeks show here as our gift to you! Thank you to all the artists that called in a greeting or sent music to play this week. As long as we have airtime, you have a platform here. * "Forever is Tomorrow" instrumental off of Sho Baraka's "Lions and Liars"
Have a very Merry Christmas as you feel the love of Christ this holiday. This week we're dropping some new music on you by The Messenger, a member of the Battleground City family out of Tucson, AZ. We also have new joints by Brinson, Exodus Movement and Secret Weapon. I want to personally say thank you to my co-workers at Samaritan Ministries International for your generosity and encouragement. You have made this Christmas an unforgettable one. I pray God blesses each and every one of you. Follow us on Twitter @KingdomMindedRS! Feel free to download the show here! 25. Brinson - Tebowing (Tribute to Tim Tebow) Available 12/20 Some proceeds of purchases go to Tebow Foundation! * Instrumental if "Half of Me" off Sho Baraka's "Lions and Liars"
Do you know what today is? It's our anniversary! That's right! Today is our 1 year anniversary of producing and airing the Kingdom Minded Show. We've grown a lot since that first episode a year ago that featured no talking. 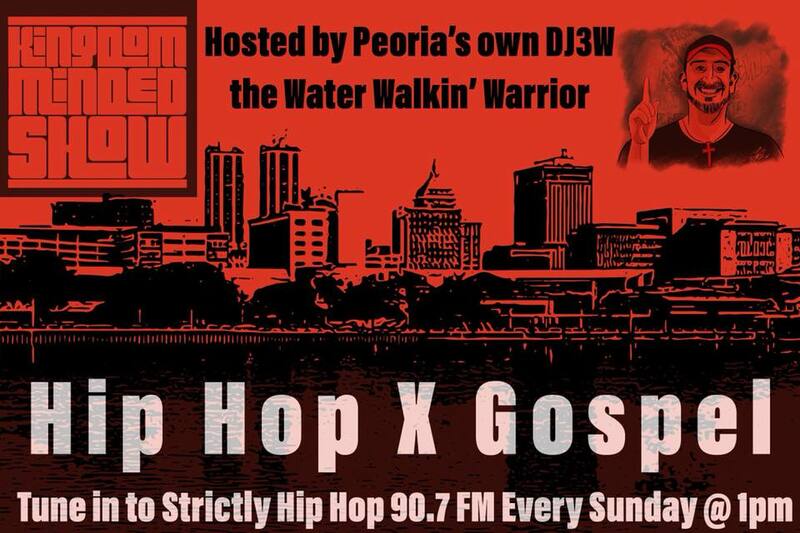 lol Our territory has expanded and we are on two stations now: WAZU Peoria 90.7 FM and GhettoGospelRadio.com. We give all honor and glory to the Most High God for the opportunity to bring Christian hip hop and contemporary Gospel to you on the platform He has given us. We look forward to many more shows and years of ministry. We have new songs by JDub, Christcentric, Dafari and Gifted Da Flamethrowa. We also have a number of call ins by some of your favorite artists and ours. We hope you are inspired by the history of how this show came to be and start striving towards your dreams and goals because of our witness. You even get to hear me, the Water Walkin' Warrior, spit a verse of an original song, but please be gracious. I was just having fun and know I'm not called to be a rapper. lol Oh yeah, and just in case I need to say this for legal purposes, I used Tony Toni Tone's "Anniversary" as a loop in 2 parts of the show. Please feel free to download the show here if you like. Please give us some feed back if you were blessed by the show today. You can call us at 775-375-KMRS to leave a message. Leave a comment on the page here at the bottom. like our Facebook page listed under Kingdom Minded show. Here is the playlist for this weeks special anniversary show! 22. Radikal Hughes - One Chance (Single) Available Soon! Instrumentals by: JustWORD, Tony Toni Tone', BenEvol, Wit, K-Beatz and some others I'll update. We hope you were inspired, encouraged, and challenged to be more Kingdom Minded! Thanks for visiting the site. Head down to the bottom of your screen and click play to listen to the show. Feel free to explore the links and download some music. We've got new music by B-Shock, BenEvol, Keisha Dream, and D-Maub/Eric Cross. We added one Christmas song and will be adding a little more next week. Speaking of next week...we are celebrating 1 year of producing and airing the show on WAZU Peoria 90.7 FM!!!!!! We want you to help us celebrate by calling our Google voice line at 775-375-KMRS and leaving a "Congratulations on 1 Year!" shout out for us that we can play during next Saturday's show. If you've been blessed by the show in any way, please share how also. You can listen online at the link here for TuneIn.com from 2-4 PM CST and at GhettoGospelRadio.com from 7-9 PM EST. Then if you miss either of those times, you can listen here 24/7. If you want to download the show, we got you too. Click the links below to download. * Instrumental is "Sticks and Stones" off of Brothatone's "Mic Check"
* Instrumental by Beat Mekanicz Prod ft After Edmund on "Shut Us Down" from Sho Baraka's "Lions & Liars"
21. Willie Johnson - What Will You Do (Spoken Word) Exclusive Kingdom Minded Feature! * Instrumental is "I Believe God" off D-MAUB's "Death Before Dishonor"